plenty of room for movement. Safe and sound on the back of the bike, with feet firmly secured in the footrests, enjoying the world as it goes by! 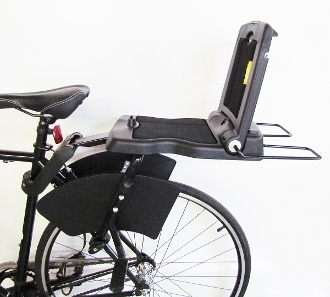 The seat is simple to mount on your bicycle. You can easily adjust the footrests to the length of your child’s legs, giving you years of pleasure from the Bobike Junior. The comfortable and rugged seat is attractively designed and made from a durable no-maintenance material that is easy to clean. Condition- These are seats that have been previously installed and refurbished by the seller and verified to be complete. Seats may have only a slight visual blemish from shipping and/or installation but are still in good condition.